"This dish is usually made with Schwabische; a kind of noodle originated from South Germany. It can be substituted by spaghetti. 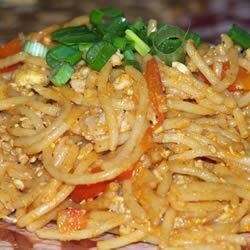 This recipe is an ideal way to stir-fry pasta in Malaysian Chinese style. A bit hot and spicy!" In a saucepan over medium heat, saute the onion in the oil until the onion is a bit brownish. Stir in the egg. Add the ground pork and stir-fry 2 to 3 minutes. Mix in the cooked pasta, salt, sugar, pepper, chile sauce, soy sauce and tomato puree. Stir-fry for 3 to 5 minutes. Add red pepper and stir-fry for another 2 minutes; pour in a bit of water if it is too dry. Sprinkle chopped green onion on top. A simple and quick weeknight pasta with sausage, tomatoes, and spinach. We have updated this recipe to call for ground pork instead of mincemeat. There had been an error in translation. Added more tomatoe paste and sauce. Easy and delicious. Kids eat it. The consistency with the egg and the pork is odd which isn't what you want when eating a plain dish like this. i really liked this recipe. I was surprised. it had good flavor and spice without being too spicy. my husband had a huge 2nd helping.